Zoe Tongue in Editor's Picks Television on 7 October, 2016. Cersei Lannister stands at her window, looking over the city from the Red Keep, a glass of red wine in her hand. It becomes clear that she is waiting for something to happen. Those first twenty minutes of the finale are the best that the show has ever seen. It’s directed beautifully, flicking between Cersei, the people filing in the Great Sept, and the unfolding events she put in motion. The stunning soundtrack adds depth and tension to the scenes, continually building up until: wildfire. A small smile creeps onto Cersei’s face as she watches the destruction of both Sept and her enemies, those that hurt her, humiliated her, and degraded her, within it. Cersei Lannister is without a doubt one of the best female characters in the show, regardless of whether she is likeable or not. She exists in a world where woman cannot dominate, yet she manages to do so anyway. Cersei is not the only woman to come out on top this season. Sansa Stark is no longer the naïve girl she was when the show began, but has survived the loss of her family and the torment she suffered at the hands of Joffrey Lannister and Ramsey Bolton, and now she’s back home at the side of her half-brother. Arya Stark, too, has hardened after all the Starks have suffered; after three seasons, she finally has vengeance on Lord Frey for the murder of her family at the Red Wedding. The finale has also finally confirmed a theory that has been circulating the internet since the very beginning of the show, and it was extremely satisfying to know that Jon Snow is in fact the son of Lyanna and Rhaegar Targaryen. Bran is the only one who knows this, however, and since Jon has now been hailed King in the North, he could end up married to his aunt Daenerys, who needs to marry in order to gain more allies in Westeros before she can take her throne. The onslaught of drama was broken up by a few beautiful moments. Daenerys has become more and more powerful throughout every season, so it was moving to see her youth come through when she sat alone with Tyrion Lannister and he told her that he never believes in anything, but he believes in her. We also see Samwell Tarly reach the Citadel, walking into his idea of heaven: a great library filled with thousands of books. When we first met Samwell, he was a coward, sent to the wall because he was a disappointment to his father. Now, we see him doing what he has always wanted, and he will most certainly make a difference in future seasons. This finale has been the best episode of the show yet, fitting so much tension and excitement into an hour and leaving a lot to look forward to next season. Cersei is now on the Iron Throne after her revenge plan led to one unforeseen fatality: her son; Daenerys Targaryen is sailing to Westeros with the Iron Fleet, where Olenna Tyrell has allied with the Sand Snakes in order to fight by her side; Jon Snow is the King in the North; and it is now winter, which means the White Walkers will be coming out to play. The TV show has now overtaken the books, as George RR Martin has yet to finish the final two instalments, which has clearly allowed the show to exercise more creativity without having to live up to Martin’s version of events exactly. It’ll be interesting to see how the books pan out in comparison, particularly as there are characters in the books yet to make an appearance in the show. It’s been confirmed that there are only 13 episodes left, to be spread across two seasons, so the next season will see the real fight for the throne and the survival of the realm. The tables have also turned so that women are now in the fight, instead of the men that were in power at the start. 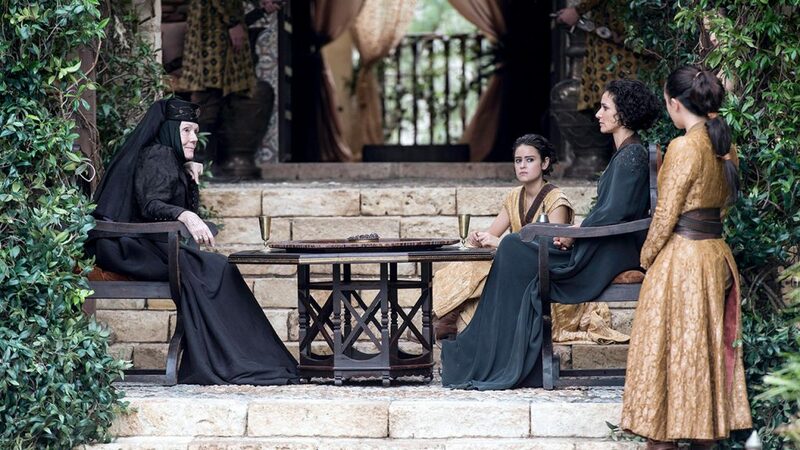 In the past, Game of Thrones has been criticised for its portrayal of women, but this season has put them at the top, elevating the female characters into worthy role models.